The whole point of this exercise is that candidates will only receive this Mayday SuperPAC funding if they agree to work towards "removing money from the campaign trail". Democracy is being kept hostage by the moneylenders and Lessig wants to buy it free? A bidding war against those running the money presses? ARE WE REALLY, paying someone to help BUY BACK our government? Its funny that long in the past, someone went to the Banker at the Congress, where these people pull money out to PAY for stuff, and Got the listing of how much they had been GIVIN, over their PAY. Is it that HARd to TRACK how much money they get paid, and compare it to how much they have SPENT? and how much is is ALL their accounts? All it takes is to show that money buys laws and change for everyone to understand the lies about superPAC's are really that just lies, it is a way to legally bribe Politicians, my thought is to go for one regulator ...Wheeler. He is in the process of destroying the internet, a big issue. Now imagine if he was promised all the money the PAC had collected if he made the internet title 11 and did it in a way that completely destroyed the monopoly that exists in broadband access control. If they could get to Wheeler and pay him off by putting this money in an offshore account, or even if they agreed to pay all politicians to support real title 11 internet neutrality by paying them in offshore accounts that would show everyone that the laws are up for sale and the people just need to start buying them. 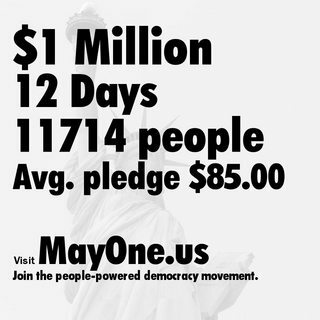 MayOne is a great project. I hope he can keep expanding on it. I'd love to see more information on the breakdown of donations, including some sense of the distribution and median donations as well. Also... agree btw. Lessig is trying and it needs more than an initial Constitutional Convention to "get the money out". Lobbying, revolving door is also part of the problem. The issue needs a multi-pronged approach and your own politicians. It's good to see you all finally do something and can't understand some cynicism for effort. I am not even American but I care because this issue clearly affects the rest of the world too. I am not saying nothing will work. I am just seriously questioning the wisdom of attacking an enemy head on on their home turf and also have about a 100 fold the resources you have. It is like a bunch of rag-tag rebels forming a proper of battle to face a professional army instead of engaging in asymmetric warfare. Now as a campaigning and awareness raising measure I have some respect for it. I also appreciate the attempt, even if I do think it is tilting at windmills, since it will give us a data point and case study to guide actions in the future. I am very interested to see exactly how this will play out. I also do think it will work out better overall than Americans Elect for example, which was a previous attempt at trying to induce a paradigm shift in the current US political system. At one point the stats you ask about were posted, average 10th and 90th percentile. At the time I posted there were somewhere around 9000 supporters. Actually, perhaps that info was on the page you get after pledging money. Anyone pledged recently and seen this? I can't believe people keep bringing this up after we've explained over and over again. The $12 million is not the goal. It's the test. They're using $12 million in a few races where it *will* make a difference to prove the point, and then will seek to raise MUCH more for the big campaign. I can't donate. Not American. Don't want to muddy the waters for you guys. It's a hard enough task that you have to get a "persons democracy". Would be interesting to see. $85 average seems a little high as a median. I reckon the median is about $10 or $20 with quite a few "big donors" considering who Lessig is and the influence he has. Wouldn't be surprised to see a few $10,000 donations in there somewhere. Money needsto be based on success. What we can do is offer campaign money to politicians that vote for a law to substantially reduce copy protection lengths only provided the law passes. One problem with that is that there maybe laws against publicly buying laws (whereas corporate interests illegally do it in private with politicians and secretive back door dealings). However, with the supreme court ruling on political adds being free speech we may be able to find indirect ways around these laws. We can crowdfund our own political adds. In fact we should just crowd fund adds criticizing copy protection laws and informing the public about them more. "I can't believe people keep bringing this up after we've explained over and over again." I can. Unfortunately, that's the way it is. Not everyone knows or has researched the issue properly and the same questions will always be asked. You need to keep saying the same thing over and over and over and over again. They are so affective that they are used to imply the opposite of the actual facts. Like Orwell's Ministry of truth. "In politics, 12 million isn't that much money"
Which is a HUGE part of what's wrong with our political system. What is meant by removing money from politics? Let's say that no money was allowed to be spent on campaigning. Then the media Comcast/NBC would have even more power by being able to chose their coverage of a candidate. Political speech would be limited to media companies. So we say ban the media from choosing the candidate. You throw the influence to the labor unions, NRA, AARP, and other groups with large member bases that can be mobilized. You are playing wack a mole with political influencers when what you really need to do is find a way to educate the public on the candidates and let them decide. We need a way to cut thru the half truths and false implications.